Nelsons Rhus Tox 30c is a natural homeopathic remedy made using rhus toxicodendron, derived from poison ivy. 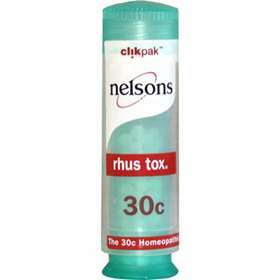 Nelsons Rhus Tox 30c is indicated to be effective in treating joint pains and fevers. Press base twice to release 2 Nelsons Rhus Tox 30c pillules into cap. Nelsons Rhus Tox 30c contains lactose and sucrose. Rhus Toxicodendron 30c, Lactose, Sucrose.